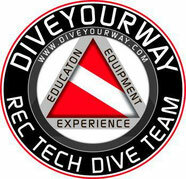 Courses - Rec Tech Dive Team. DIVEYOURWAY. There are many different things to try and explore in the world of Scuba Diving. We strongly beliefe that a good diving education is the necessary foundation for all the possible exciting underwater activities. We work with the world leading Scuba Diving organisations, to provide you with the best courses possible. Our experienced instructors will teach you in small groups, to make sure each individual gets the attention that is needed. This way your course will be a great an fun experience for you and us. We look forward to meet you! PADI (Professional Association of Diving Instructors) is the world’s largest recreational diving membership organization. PADI Professionals make underwater exploration and adventure accessible to the public while maintaining the highest industry standards for dive training, safety and customer service. The PADI System of diver education is based on progressive training that introduces skills, safety related information and local environmental knowledge to students in stages. PADI courses are student-centered and provide for maximum practice and application. Students learn the basics through independent study and then are guided through additional development by their instructors. The goal is to get students in the water as soon as possible and provide them with the instruction necessary to gain confidence in their diving abilities. TDI is the largest technical certification agency in the world. As one of the first agencies to provide training in mixed gas diving and rebreathers, TDI is seen as an innovator of new diving techniques and programs which previously were not available to the general public. Training with TDI has provided divers with the opportunity to see such wrecks as the Andrea Doria, Luisitania and the Prince of Wales. TDI divers have explored underwater caves in Spain, Australia and Mexico and assisted as support divers on world record freedives done in the Red Sea. TDI’s professionals are held to the highest standard to ensure quality training throughout the world. This means that as a diver taking a TDI course, your instructor will have documented his experience and knowledge prior to achieving that rating. As an instructor candidate taking a TDI course, your TDI instructor trainer will have gone through the paces to achieve the highest level of training that TDI offers. TDI is committed to offering the highest quality training supported by the latest materials with the most up to date information and techniques. TDI’s materials are written by authors that acutely conduct the type of diving they are writing about. Those same materials are update as technology and equipment change. Emergency First Response courses encompass adult, child and infant CPR and first aid skills, and incorporate Automatic External Defibrillator (AED) training and emergency oxygen use. Emergency First Response also offers comprehensive First Aid at Work courses, specifically designed to meet compliance standards for workplace safety courses internationally. Emergency First Response courses are flexible in design to accommodate scheduling and training needs. They can be taught together or alone in any combination. The Emergency First Response courses build lay rescuer confidence to provide care when faced with a medical emergency. Students learn and practice the same patient care techniques and principles used by medical professionals, but at a lay person level. DAN provides comprehensive training to the dive community by disseminating the latest information on topics related to diving safety through articles, reports, seminars, lectures and training programs.